I was reading in Matthew Chapter 4 about the Temptation of Christ last night and saw things with a fresh perspective. I mean most of us know about the temptation, but what the Word of God reveals is just really enlightening. 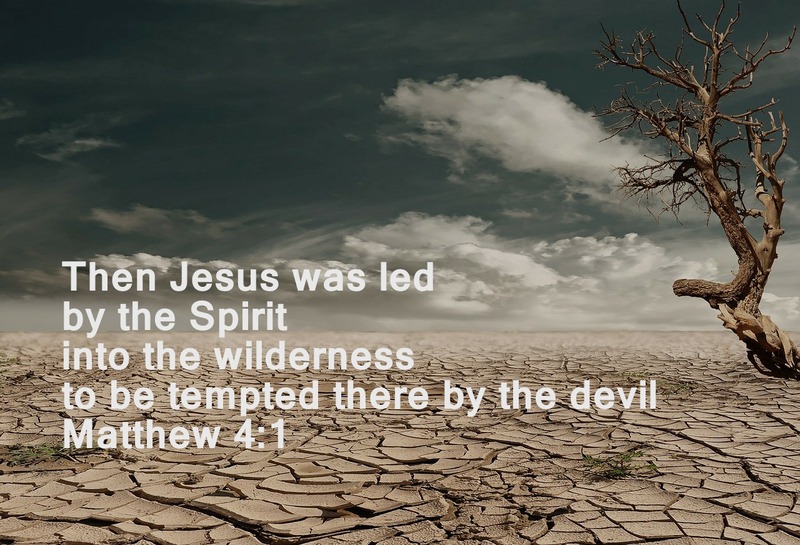 First I noticed that Jesus was led by the Spirit into the desert to be tempted by the devil. Even in temptation He was led by the Spirit; He didn’t just waltz into a bad situation He was following God’s will, most surely to be an example for us. If Jesus was led by the Holy Spirit, even in temptation how much more do we need to be led of the Holy Spirit? Second, I read in verse two He was hungry. I know Jesus was fasting for forty days, but I always think of Him on this earth as a super human deity, not a mere man sent here to walk out life just as we do. Satan tempted him first in the physical. Your hungry, meet the need. So many times we give in to the temptation to compromise for worldly things – maybe to meet our basic needs or just to meet physical needs in general. We give in to the temptation. Jesus answered, “It is written: ‘Man does not live on bread alone, but on every word that comes from the mouth of God. He wasn’t saying “I’m not hungry,” just that his first command is to obey every word from God; Jesus knew that was His purpose in the wilderness that day. He obeyed His Father. Then I noticed that in the second temptation the devil took him. I still believe that the Holy Spirit was with him guiding and directing him, just this time God gave Satan permission to led Jesus into the temptation. I think a lot of times instead of following the Holy Spirit, or being led into temptation, we put our selves into a tempting situation knowing it is a problem, plugging our ears, heart and soul to the Spirit’s prompting of “STAY AWAY” and Satan just follows along coming in the door we opened for him, at which time He has free reign. The second temptation Satan tempted Jesus to prove who he was. So many times we compromise who we are to prove something to someone. The fact is we are who God says we are. We can put that to the test, it will always come out true. However, as Jesus answered, we can not test God. I think that is one of the reasons that Shadrach, Meshach and Abendigo made the statement “Even if God doesn’t.” They believed their God would save them, but even if He didn’t they would still follow Him. We do not need to prove who we are; we are everything God says about us. He can not lie, so it is true – no need to prove it, just live it. T.D. Jakes made a great comment – we can see a black box and if we say it is green, it doesn’t change the fact that it is really black. If God says that same box is white – it will be white. That is how we must be; we must accept the reality of what God speaks about us in His word. He can not lie, He is just a gentleman and waits for us to let go of the lies we have told ourselves about who we are so He can reveal in us what we already are. The last temptation was for power and control. Satan wanted the same thing that day on that mountain that he wanted when he was kicked out of Heaven – to be worshiped. He was even willing to give up something that wasn’t his to give to get it. How many times do we end up worshiping something that isn’t even “all that?” We put the guy, the job, the celebrity, the church, the newest toy on a pedestal we think if we devote all our time and energy to it that it will be all we ever hoped and dreamed for. But the fact is their all tools of Satan because we are to ‘Worship the Lord your God, and serve Him only. Satan sidetracks us even with church to keep us from worshiping God and serving Him. Another thought that came to me is “serving Him.” How do we do that? The Bible says that if we have done it to the least of these we have done it unto Him. So we serve others. We serve those less fortunate, more fortunate, and everything in between. When Jesus was done being tempted the Bible says “Then the devil left him, and angels came and attended him.” Eventually when we prove that we can stand up to the temptation it will leave us. Then we can be ministered to by the angels around us. Sure Satan will come back, but we just have to remember Greater is He who is in me, than he that is in the world. This entry was posted in Hope and tagged Messages, Scripture, Temptation. Bookmark the permalink.